What Is The Difference Between Quiz Title & Quiz Description? Let your quiz takers know more about the quiz before they even get started with a descriptive quiz title and description. While creating your quiz you may have noticed there is a quiz title and a quiz description, but what is the difference and why do you need two? First the quiz title. This is the name of your quiz, and is typically shorter then the description. It will provide just enough information for someone to know what your quiz is all about. Some examples of quiz titles are, "What is your entrepreneurial personality? ", "Could you have a thyroid problem? ", and "Which LeadQuizzes product is right for you?". Now the quiz description will let the quiz taker know a little bit more about your quiz and just exactly what they are getting into. 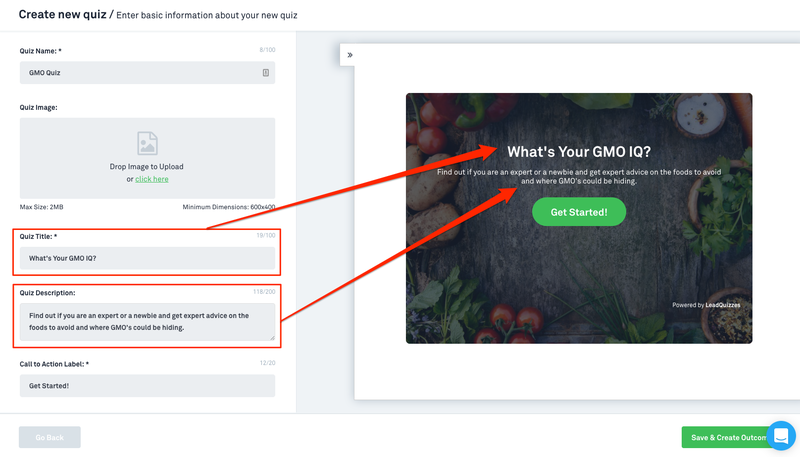 The description is a way to expand on your call to action to take the quiz. Some examples of quiz descriptions are, "Take the quiz and find out what your true entrepreneurial style is! ", "Take the quiz and discover if those symptoms could be a thyroid problem or something else..." and "Take the quiz to discover the perfect product for you based on your business and the amount of traffic you get." It's important that you test your quiz title and description until you find one that works for your specific quiz!